The Falls is a Great Property! 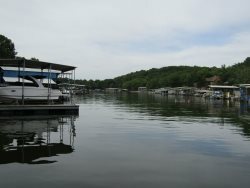 This gorgeous 4 bedroom penthouse condo is located on the 2 Mile Marker of the main channel and offers one of the best locations and views at the lake! This condo is a non-smoking, single level, upper floor unit with minimal stairs, offering 5 flat screen TVs, WIFI, along with one assigned parking space as well as two additional spaces in front of the assigned garage. This unit offers a master bedroom with a King bed, deck access, and a walk in shower with grab bars. Two out of the three other bedrooms include deck access as well and accommodate the additional bedrooms with a King in the second bedroom, a Queen in the third bedroom, and a bunk bed with a twin on top and a full on the bottom. In addition, this unit offers beautiful flooring, unique furniture, and a wet bar. You can't go wrong with this condo! The Falls complex offers two outdoor pools, tennis courts, and a playground. Friendly, positive, helpful staff. Good experience. Thanks so much for your help. Life changing weekend! So relaxing and we were all refreshed and are better because of the beauty you have to offer. They were very professional and friendly. When the problem arose with the wasps they handled it immediately. Our experience with your staff is very satisfied and appreciative. We all loved it and want to rent this e condos again. PMG staff was friendly, helpful and most accomodating! Two swimming pools are convenient; condo was spacious, clean and well-organized. Everything was as advertised, convenient to shopping, eating, playing etc.